I am starting a new Thrifty Holidays Series,.Every Friday till Christmas I'll post a thrifty gift idea you can make for your holiday giving. 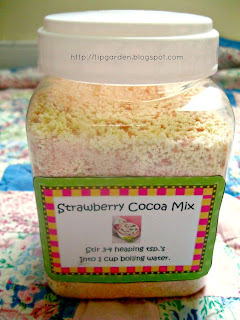 My first Thrifty Gift is Pink Hot Cocoa Mix. With the air turning chilly and cups of hot cocoa in the ready, this non-chocolate hot cocoa is not only tasty, it is fun and a great substitute for the non-chocolate lover in your family who may feel left out during hot cocoa time. Whether you want to call it Pink Hot Cocoa or Strawberry Hot Cocoa, this 4 -ingredient mix takes less than 5 minutes to mix up. It would be a cute gift in a pretty jar or those Hot Cocoa Cone bags topped with mini marshmallows and tied with a cute bow. 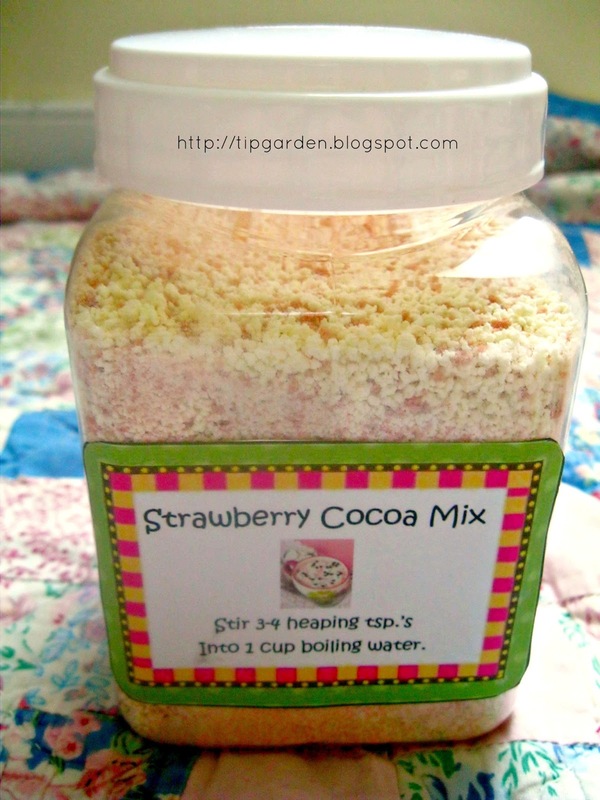 It makes about 6 cups of mix, so you'll have plenty to store some in a larger airtight container for yourself as well as several affordable gifts. Mix together all ingredients; Store in an airtight container. To Serve, place one cup hot/boiling water in a mug, stir in 3-4 heaping Tablepoons of mix. Makes about 6 cups of mix. I make a coffee drink that is easy to make, I remember it by 3 - 2 - 1. 3 cups of powdered milk, 2 cups of sugarfree powdered chocolate mix, 1 cup instant coffee and 1 cup of Splenda or Splenda blend. I shake it in a ziplock bag then store it in a mason jar. 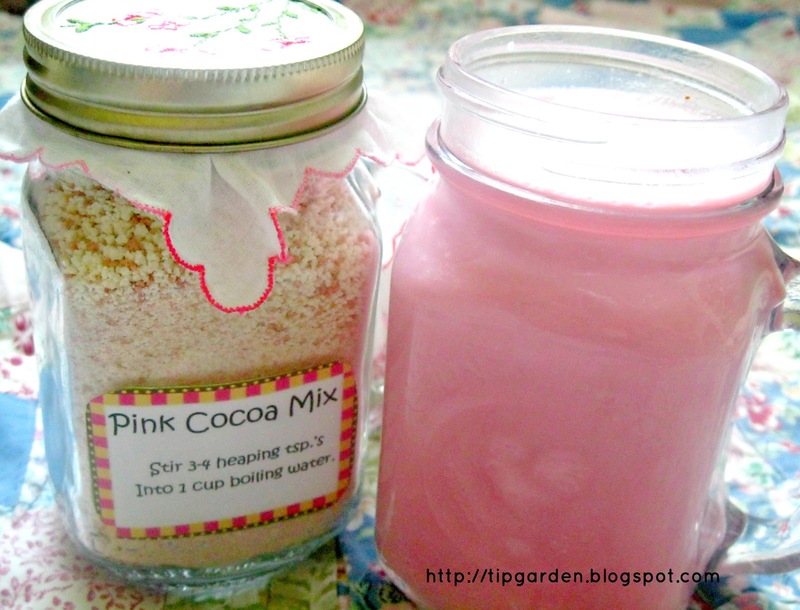 Mix 3 tablespoons of the drink mix with a cup of hot water, then enjoy. It's easy to take on the road, and sugarfree! Sakura, thanks for sharing the recipe! I don't drink coffee, so I would never have come up with that mix! You rock! What a different idea! Thanks. Welcome Kathy! And thank you for the invite! I'd love to hop over and link up with you! I'll be right there! Hope to see you back again next week with another clever gift idea! What a great idea - but I'll just supplement my chocolate fix instead of replacing it! Pinned! Thanks for linking on Busy Monday! Hi Jan, thanks so much for sharing your Pink Hot Cocoa Recipe! I can't wait to see what your next gift giving idea is going to be. I'll be featuring it at the highlight party tomorrow night (Monday) at Project Queen! How exciting, thanks for featuring it! Thanks so much for sharing my post! I am thrilled! Just wondering, but what kind of strawberry drink mix did you use? Like the nestle strawberry milk drink mix or? I can't remember if it was Nestle's brand of strawberry milk powder or a generic store brand version, but it was that type of drink mix.